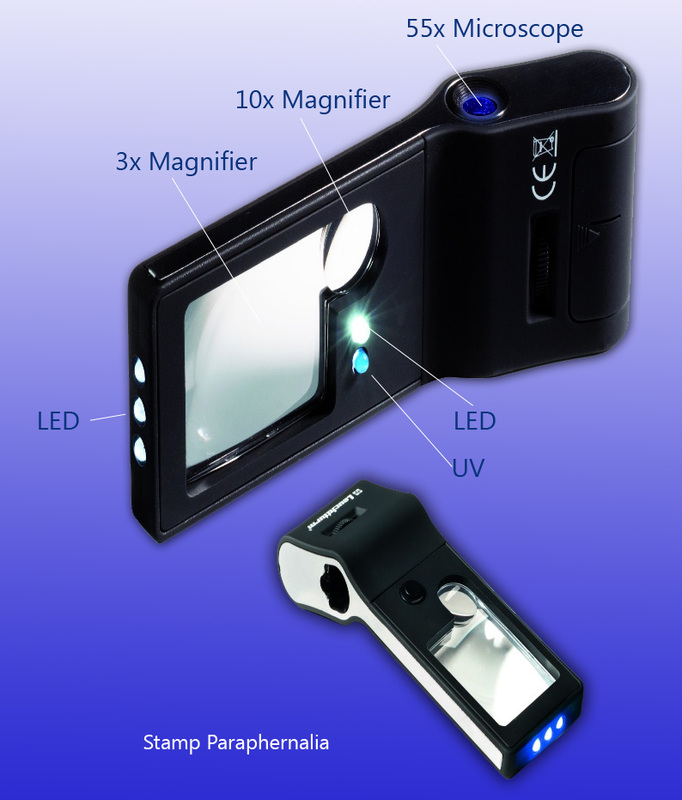 Multi-function LED magnifier and microscope in one versatile, pocket-sized unit: Two aspheric Perspex lens (large lens with 3x magnification, small lens with 10x magnification) and powerful LED microscope (up to 55x magnification) with built-in focus wheel allow examination of an object at various levels of detail. Additional light functions: three-LED flashlight, simple UV light to check the authenticity of bank notes and stamps, and one white LED light to permit viewing of collectibles even in poor lighting conditions. Black composite housing. Dimensions (W/L/H): 1 ½ x 4 ½ x ¾" (39 x 115 x 19 mm). Lens size: 1 ¼ x 1 ½" (30 x 37 mm) rectangular and 5/8" (15 mm) diameter round. Battery powered. Includes 3x AG10 button cells and protective leatherette pouch.